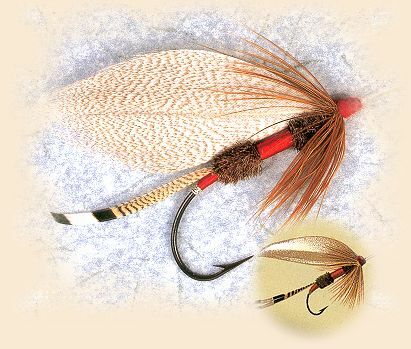 "Royal Coachman Wet - Old Flies - Fly Angler's OnLine Volumn 5 week 41"
Quoting from Favorite Flies and Their Histories by Mary Orvis Marbury, "The Royal Coachman was first made in 1878 by John Hailey, a prefessional fly-dresser living in New York city. In writing of other matters, he inclosed a sample of this fly for us to see, saying: "A gentleman wanted me to tie some Coachman for him to take up into the north woods, and to make them extra strong, so I have tied them with a little bank of silk in the middle, to prevent the peacock bodies from fraying out. I have also added a tail of the barred feathers of wood-duck, and I think it makes a very handsome fly." A few evenings later, a circle of us were together "disputing the fly question," one of the party claiming that numbers were "quite as suitable to designate the flies as so many nonsensical names." The others did not agree with him, but he said: "What can you do? Here is a fly intended to be a Coachman, yet it is not the true Coachman; is quite unlike it, and what can you call it?" Mr. L.C. Orvis, brother of Mr. Charles Orvis, who was present, said: "Oh, that is easy enough; call it the Royal Coachman, it is so finely dressed!" And this name in time came to be known and used by all who are familiar with the fly." 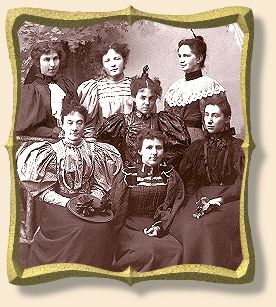 In the photo above, the Orvis Fly Room staff, circa 1880, from Forgotten Flies. Body: Peacock herl, scarlet floss center joint. Credits: Quoted text and small photo from Favorite Flies and Their Histories, published by Lyons Press. Large photo and Orvis Tiers Photo from Forgotten Flies, published by Complete Sportsman.